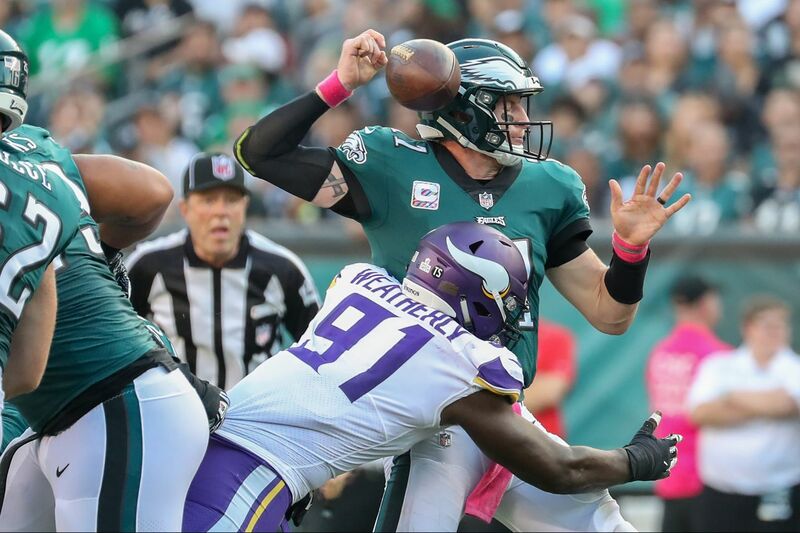 Eagle quarterback Carson Wentz has the ball knocked out of his grasp by Vikings’ Stephen Weatherly in the second quarter. This play was crucial to the outcome of Sunday’s game at Lincoln Financial Field. The Eagles did something Sunday they hadn't done in Carson Wentz's previous 31 NFL starts. They lost with their leader posting a 115.3 passer rating, with Wentz completing 24 of 25 passes for 311 yards and two touchdowns in a 23-21 home loss to the Minnesota Vikings. This was the highest rating Wentz has recorded in an Eagles loss, on the heels of last week, when the team managed to lose with Wentz posting a 99.4 passer rating, higher than his figure in any 2017 Eagles loss. The strength of the Eagles' offense, outside of Wentz, isn't superstar receivers or All-Pro running backs. They don't have those. What they are supposed to have, what they had in winning the Super Bowl eight months ago, is a great offensive line. The Eagles are 2-3 right now in large part because they do not have a great offensive line this season. There are many other factors, from puzzling play calls to a pass defense that never shuts down anyone, but if the offensive line played up to its billing, the Eagles would have won last week at Tennessee and they would have won Sunday. One play summarized Sunday's loss. The score was somehow tied, 3-3, even though the Eagles had closed the first quarter with minus-4 yards in total offense. But Wentz was moving the team, 34 yards in four plays, first down on the Vikings' 31. Score a touchdown here and take control, everyone forgets the first quarter. Stephen Weatherly, a third-year backup defensive end from Vanderbilt, drafted in the seventh round in 2016, zipped inside Eagles All-Pro right tackle Lane Johnson and blindsided Wentz just as he cocked his arm to throw. The ball blooped into the air. Vikings defensive tackle Linval Joseph ran under it and rumbled 68 yards for the touchdown that gave Minnesota the lead for good. If you were scoring at home, it was either a 10- or 14-point turnaround. Johnson said he envisioned a blitz that did not materialize. "I overkicked, thinking the edge guy was coming. The end came under and got the sack," Johnson said. "A play I'd like to have back. Other than that, though, I think I recovered." "At that point, I felt like we got the momentum and ran with it," Weatherly said afterward. "I'm not playing up to my standards, and we've got to pick it up," said Johnson, who gave up a similar strip sack at Tennessee. "I'll bite the bullet on this one. I know I'm capable of being a great player." Brandon Brooks (left), Jason Kelce and Isaac Seumalo walk off the field after the Eagles lost to the Vikings on Sunday. Johnson noted that the 2017 Eagles almost always started fast. Sunday's start was horrible, the Eagles losing 12 yards on their first series and failing to convert third down on their next series because the third-and-1 play call was a slow-developing pitch to rookie running back Josh Adams. It was the only carry of the day for Adams, who was swarmed by Vikings for a 1-yard loss. The first series died on a sack given up by left guard Isaac Seumalo, in his first start of 2018, in place of Stefen Wisniewski. If switching Seumalo for Wisniewski did anything other than make the line more hirsute, that was not apparent from Sunday's play. Seumalo, asked whether he could answer a few questions, said, "no," and brushed past reporters gathered around his locker. "Wiz has played superb football here, won us the Super Bowl," Johnson said, before extolling how well the two guards were handling the situation. Left tackle Jason Peters, playing through a quad injury, seemed to labor. After the game, Peters suggested that Wentz, still early in his return, wasn't getting the ball out as quickly as he might. "Right now, we're struggling on the offensive line, because we have to block longer," Peters said. "We have a quarterback that's coming off an injury, and he wants to make a play. We just have to block longer in order for him to make a play. We just have to be better in pass protection." Of course, pass protection is tougher when the opponent is pretty sure you're throwing the ball. Take away four of Wentz's five carries – only one seemed to be a designed run – and Doug Pederson called 13 run plays Sunday, which is a great way to make sure an offense never gets any rhythm. Only five of those runs were called in the first half, which ended with the Eagles trailing, 17-3, having compiled all of 91 total yards. Wentz was sacked three times. He took an intentional grounding penalty trying to avoid a sack, on third-and-10 from the Vikings' 40, after Nigel Bradham's fumble recovery gave the Eagles the ball on the Minnesota 30 and a chance to grab control, down, 20-14, with 10 minutes, three seconds remaining in the fourth quarter. "We got to pick up pressure better," Johnson said. "We're letting guys loose, Carson's running all over the field. Usually, the offensive line's playing good, we're going to win games. And when we're not, you'll see results like tonight." Again, stunts and loops and blitzes seemed to confound the Eagles' line in ways they did not a year ago. "There hasn't been too many times when a guy has just got flat-out beat on his own," center Jason Kelce said. "You see a lot of 'games' happening. We've got to get back on the practice field and work games. We've gotta work on passing things off, taking the correct set line so that you're in a position to work with the person next to you. … That's what's gotten us all year, offensively."